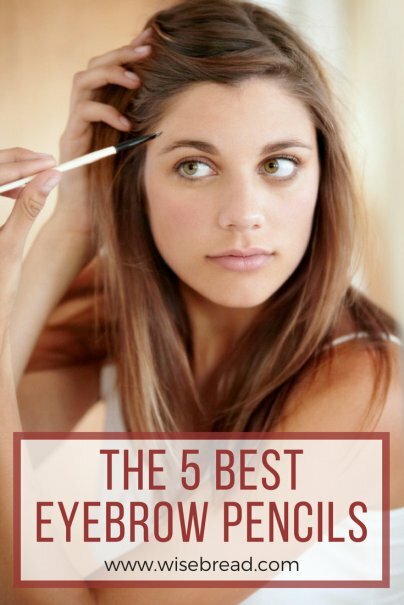 An eyebrow pencil can help you create picture-perfect eyebrows in a matter of minutes. Whether you want thicker, fuller brows, or simply want to define your natural brows, an eyebrow pencil can help you achieve your ideal look in no time. An eyebrow pencil is a cosmetic item that can define, shape, fill out, and accentuate the eyebrows. It looks like a normal pencil, but instead of lead, it is filled with a pigmented makeup. Beautiful eyebrows can frame the face and will help attract people to your eyes, which is why many women can’t step foot outside without first filling in their brows. If your eyebrows are too light or sparse, an eyebrow pencil can thicken and fill them in. Even if you like the shape and thickness of your brows, an eyebrow pencil can still help define, shape, and set your eyebrows for all-day wear. You can also add a layer of eyebrow mascara on top of the pencil for extra staying power. Anastasia knows brows, and that's why the award-winning Anastasia Beverly Hills Brow Wiz is the brand’s bestseller. Most makeup artists swear by the brand, whether you prefer eyebrow pencils, powders, or gels. The super-slim mechanical pencil can be used to outline the overall shape of the brows, fill in sparse areas, or fill in the brows completely. The slim tip can create the perfect precise line with natural, hair-like strokes of color. While many reviewers use this pencil on their entire brows, others found it best to just outline their brows in this pencil and then fill it in with an eyebrow powder or brow gel for a more subtle, natural look. There is also a spoolie attached to the other end of the pencil, so you can perfectly groom and shape your brows. This is one of the most highly recommended eyebrow pencils by professional makeup artists, celebrities, YouTubers, and beauty bloggers alike. 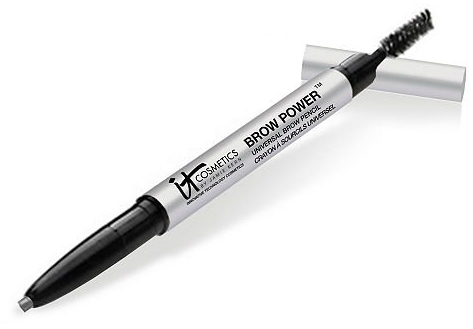 If you aren’t sure which eyebrow pencil color is right for your skin tone and hair color, then the It Cosmetics Brow Power Universal Brow Pencil is perfect for you. This pencil is unique because it works on all hair types and hair colors and can even cover grays. This universal paraben-free eyebrow pencil contains a patent pending complex, which restores hair follicle health, so your brows will be naturally thicker and healthier with every use. If you have thin or thinning eyebrows, this pencil may even be able to help you grow back your brows. Developed by leading plastic surgeons, it contains proprietary anti-aging technology, which infuses a blend of brow-conditioning ingredients like Saw Palmetto, Nettle Extract, Green Tea, Biotin, Lecithin, vitamins A, C, and E, Grape Seed, and Panthenol to improve the condition of your eyebrows. The exclusive oval tip is perfect for both thin and thick eyebrows and will allow you to create the most natural-looking brows. Along with the bestselling pencil, there is also a spoolie attached to the other end of the pencil so you can smooth out the color for natural-looking results. The smudge-resistant pencil adjusts to all skin tones and hair. You can also control the intensity of the color by how hard you press the pencil into your eyebrows. The waterproof, sweat-proof pencil will last even through workouts. It will help you define your brows and give them great shape and even after you wash it off, the eyebrow enhancing technology will leave you with naturally thicker brows. The pencil swivels up to sharpen, so you won’t have to worry about having a pencil sharpener for this pencil. It is a top-rated beauty product, an Ipsy favorite, and was also chosen by TotalBeauty as one of the best brow enhancing products. As Amazon’s #1 new release in eyebrow color, the NYX Eye Brow Push-Up Bra, Lift and Draw Brown/Pale Pink Highlighter is something you can’t afford to miss. The dual-sided pencil defines and highlights the brows and eye area, so you can create picture-perfect brows in no time. It will help you create the lift and brighten the area under the brows, giving you a push-up bra effect for your brows. The universal defining shade flatters all skin and brow tones, so it is a one-color-fits-all pencil. It can be used to define your brows, fill in sparse arches, or fill in your brows completely. It is easy to apply and blends well, making it perfect for beginners. The highlighting shade can also double over as a concealer, making this the perfect multitasking item for your travel bag. MAC offers some of the best, highest-quality makeup items and the MAC Eyebrow Pencil is no exception. This cult classic will stay all day, even through workouts. It goes on smoothly, blends nicely, and will leave you with beautiful, natural-looking brows. The pencil is thin, so you can easily create the perfect brow shape. It is self-propelling and self-sharpening, so you won’t need a pencil sharpener. There are a number of colors available, so you can find the perfect one for your skin tone and hair color. While many reviewers use this pencil on their entire brows, others found it best to just outline their brows in this pencil and then fill it in with an eyebrow powder for a more subtle, natural look. It is a top-rated beauty product, commonly recommended by professional makeup artists, and was also chosen by TotalBeauty as one of the best brow enhancing products on the market. If you’re looking for a natural-looking brow filler, then Rimmel London Professional Eyebrow Pencil is the one for you. It can help contour, enhance, and shape the brows. It can also fill in gaps or lengthen the arc of the eyebrow. The other end of the pencil has a built-in brush, allowing you to perfectly shape the brows to your desired look. It can create the perfect natural look and match any hair color. It applies easily and will last all day. The long wear color doesn’t smudge, but will wash off easily at the end of the day. In fact, many reviewers and beauty gurus found that Rimmel offers the perfect shade for blondes. It is a top-rated beauty product, was also chosen by TotalBeauty as one of the best brow enhancing products on the market, and is also frequently recommended by YouTube beauty vloggers. And those are our recommendations for the best eyebrow pencils. As always, be sure to check Wise Bread's Buying Calendar to learn when and how to buy just about anything!